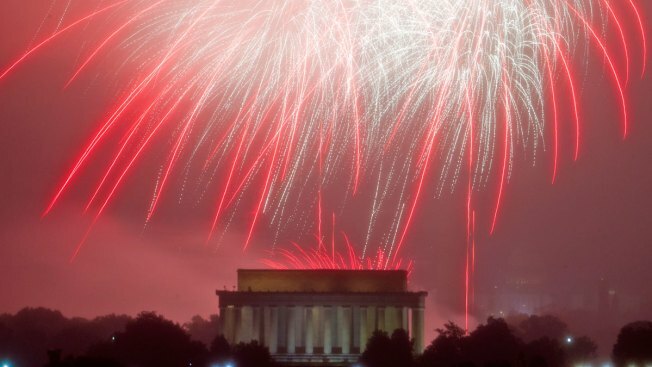 Viewers wrote to PBS's ombudsman calling the show "a sham" and "very tacky"
Fireworks explode over Lincoln Memorial at the National Mall as seen from Arlington, Virginia, during the Fourth of July celebration on Monday, July 4, 2016. PBS has apologized for after a contractor spliced video of old fireworks displays into live footage of that show. PBS has apologized after many viewers noticed their coverage of the Washington, D.C., fireworks Monday night didn’t match what was actually happening in the sky. Storm clouds created poor visibility for the fireworks display at the National Mall. However, some of the footage aired by PBS during "A Capitol Fourth" showed fireworks exploding under clear skies, plus without the scaffolding now covering the Capitol. The producers of the show made the decision to add fireworks footage from previous broadcasts because of the bad weather, acccording to a statement. They said they wanted to create the best viewer experience but realized their mistake for not being more upfront about the broadcast. The Twitter account for the show apologized for the confusion in a tweet early Tuesday morning. In a post on Tuesday, PBS Ombudsman Michael Getler shared letters from disappointed and offended viewers calling the show "a sham" and "very tacky." Getler wrote that he didn't understand why the producers didn't show a disclaimer explaining why all the video wasn't live. "Was anyone at PBS looking out the window, watching the program, aware that old clips may be forthcoming, thinking that this might not go down well with some of the public, upset?" he wrote. PBS has told the producers of the show that the program should have acknowledged it used old footage, and a disclaimer was added to the show's online version, according to Getler.